The apricot isn’t the most user-friendly fruit in the world – but put it in the right dish and treat it with respect, and you will create something that few can resist. Felicity Cloake in The Guardian shows us how. The golden, softly glowing apricot is a fruit that promises much in the bowl, but often proves disappointingly bland and woolly in the eating, whether you buy them in Provence or Preston. The problem, according to Jane Grigson, is the plant’s delicacy. “It blossoms early,” she points out. Hence the name, which comes from the same Latin root as the word “precocious”, and means that the flowers are easily caught by frost. And then, such fruit as manages to grow is picked early – and reaches us in a sadly underripe condition. If you happen to have a good source of local apricots, picked at the perfect time, then, by all means, gorge yourself on fresh fruit – the British apricot season tends to go on longer than the European one, so we have a couple of weeks yet before they’re gone for good. If not, and if, like me, you can rarely resist their blushing charms on the market, then, as Grigson so wisely notes, “you will perhaps be wise to regard apricots as a fruit for the kitchen, then you will not be disappointed”. Cooking brings out the apricot’s wonderful sharp sweetness, which Nigel Slater describes beautifully in volume two of Tender as boasting “notes of peach, brown sugar and orange blossom, and an opportunity for pleasure that is too good to miss”. In my opinion, it is best showcased in an open tart, where its gorgeous colour can be appreciated along with its glorious flavour. They may be spilling from shelves right now, but should you have an uncontrollable urge for an apricot tart when they’re not in season, you could do a lot worse than Mary Berry’s “wobbly” version using the tinned variety. They will never have the acidity of their fresh brethren, so I would suggest adding a spritz of lemon juice to the fruit before cooking to help boost their flavour. At this time of year, however, there’s no substitute for the real deal, and it seems a shame to cook them down to a virtual jam as in Lulu Peyraud’s recipe in Richard Olney’s classic collection, Lulu’s Provençal Table, delicious as it tastes. Jane Grigson’s old-fashioned apricot tart, inspired by the ones served at the annual basil and garlic fair in Tours, uses fruit poached in a light syrup that doesn’t seem to make a great deal of difference to their flavour or texture. Half an hour in the oven seems to be sufficient to cook all but the hardest of fruit through. Of those who use apricots in their raw state, Nigel Slater macerates them in sugar and marsala wine before use, while Julia Child simply blanches them to remove the skins. Unless these are very pitted, this seems a shame; I rather like the chewiness they add, but oddly enough Child’s apricots are the best tasting of the lot, being both sharp and sweet at once. This I can only attribute to the sugar that sits on top of them during baking, which must caramelise even as it draws out their liquid – but, whatever her magic touch, I’m stealing it. The real debate, however, isn’t over apricots at all, but about what else ought to accompany them in their pastry shell. Peyraud, having simmered them into thick, sticky deliciousness, needs nothing more than a few silvered almonds (the wet, fresh sort preferably, but we’re several months too late for that, more’s the pity), while Child keeps it even simpler by simply topping them with sugar and butter. I suspect this is an approach that would be better with concentric circles of overlapping fruit than the packed halves I go for, as the liquid butter would soak in to the apricots themselves, rather than sitting in the hollows between them. Grigson steps things up a notch with a kind of tangy custard made with sour and double creams, eggs and sugar, which is lovely, but very rich indeed – I prefer a dollop of creme fraiche on the side as a contrast, rather than binding the two up together. 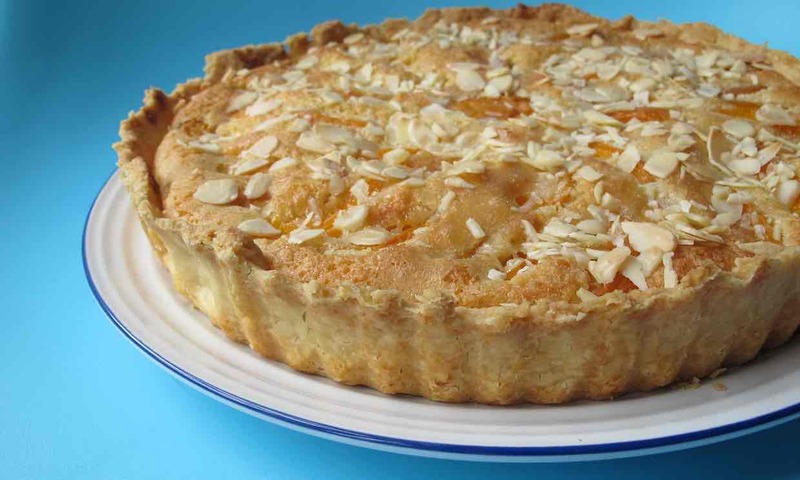 None can compare, however, to Slater’s frangipane base – a classic pairing for apricots, given almonds belong to the same family. I prefer more fruit than he puts in, but the combination is unbeatable, and lighter than Berry’s grated marzipan (though the latter is much quicker, and, in its own way, rather good too, especially if you happen to have some still hanging around from last Christmas). All the tarts I try use shortcrust, and, to be honest, shortcrust is always delicious, whether it’s savoury and ultra-crumbly, as in Peyraud’s recipe, which utilises the same free-form shell as she deploys for a pissaladière (Niçoise onion and anchovy tart) or a rich, sweet egg-yolk spiked variety like Slater suggests. My favourite, however, comes from Child again, whose pastry is unbelievably crisp, making a great contrast to the soft frangipane and fruit in my version. Blind baking is essential – at the risk of incurring a kindly rap on the knuckles, my attempt at Berry’s recipe has a rather soggy base. Grigson and Child both glaze the finished articles, the former with the apricot poaching liquid, reduced (and, in my clumsy case, taken halfway to caramel), and Child with apricot jam, but I don’t think such gloss will add much to my frangipane. I do like the crunch of the flaked almonds Child scatters over the top however – you can never have too many almonds in my book, and they’re considerably harder to burn than a syrup. Best served with a dollop of tangy, yellow crème fraîche. To make the pastry, mix the flour, sugar and salt in a bowl or food processor, and then grate in the cold butter. Rub this into the flour, then stir in just as much cold water (about 1 tbsp should do it) as you need to bring it together into a dough. Wrap in clingfilm and chill for at least 30 minutes. Grease a 25cm tart tin and roll out the pastry on a lightly floured surface until large enough to line the tin. Do so, then chill for another 30 minutes. Heat the oven to 200C. Line the pastry shell with baking paper and weigh down with baking beans or dried pulses. Bake for about 15 minutes, then remove the paper and beans and bake for another 5-7 minutes until golden. Take out of the oven and turn down the heat to 180C. Meanwhile, make the frangipane. Cream together the butter and sugar, apart from the extra 1 tbsp, until fluffy, then beat in the eggs. Fold in the dry ingredients and zest and a pinch of salt. Cut the apricots in half, remove the stones, then cut all but one into wedges. Spoon the frangipane into the pastry shell, then arrange the apricots in concentric overlapping circles on top. Cut the last in half and put one half, cut-side down, in the middle (you can eat the other; chef’s perk). Scatter with the remaining sugar and bake for about 30 minutes until golden, scattering over the almonds five minutes before the end, then allow to cool before removing from the tin. Frangipane tart: the best final resting place for an apricot, or do you have other plans for the last of the season’s fruit? And does anyone manage to grow great apricots at home in this country?